What did you walk on last? Germs are everywhere. 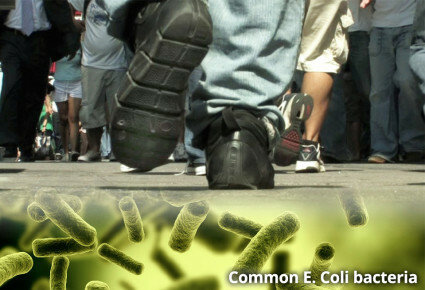 On a daily basis, the average person is exposed to millions of germs. One of the primary points of this exposure is the soles of our shoes. We pick them up from the multitude of surfaces we walk on, and ultimately track them into our places of work and our homes. Wherever these germs eventually wind up becomes a breeding ground for a plethora of microscopic enemies – ready to infect us with a variety of illnesses. Health studies by the Centers for Disease Control and Prevention (CDC) show that chronic conditions make up for nearly 75 percent of health care claims. This could include sicknesses such as the flu, the common cold, allergies, pink eye and gastrointestinal viruses. By including these different types of illness into the overall cost of sickness, ill health costs employers $1.1 trillion annually, while $277 billion is spent on treatment. This does not include the out-of-pocket cost that many of these illnesses can bring to employees themselves. According to the American Academy of Allergy, Asthma and Immunology, 40 to 50 million Americans suffer from allergies. It is estimated that 17.3 million suffer from Asthma in the US. The key to reducing allergic reactions is to prevent these contaminants from entering an indoor environment. A clean indoor environment, home or work, can make a significant difference to an individual’s health.